ET Would Be Green With Envy | Faddegon's Nursery, Inc. Beneficial Insect: ET Would be Green with Envy! The other day I was helping out in the nursery when I noticed a cluster of people oohing and ahhing by pots of Sedum ‘Autumn Joy’. Imagine my surprise when I saw a huge praying mantis peacefully poised on one of the sedum’s rosy-pink flowers. Magnificent! When I returned about ten minutes later, ‘she’ was just finishing noshing on a bug, its body parts still dangling from the mantis’ robotic-like jaws. Cool! 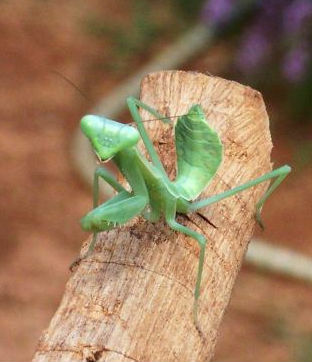 Praying Mantis is one of many beneficial insects that snack on ‘bad’ bugs. I haven’t seen one of these fascinating creatures since I was a child (safe to say decades ago). This must be the year for these amazing creatures as we have seen a number of them in the nursery in the past few weeks. Numerous customers have also stated they’ve noticed more in their gardens. Why not go take a peek around your gardens and see if this prehistoric-looking insect greets you with an inquisitive ‘eye’?